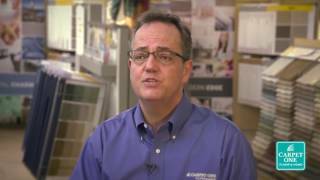 American Carpet One Floor & Home in Augusta, GA is your local destination for fine hardwood flooring and related services. From our ever-expanding hardwood inventory, to our in-house installation and refinishing services, we’ve got all of your needs covered. Starting with the very moment you step into our showroom, we’ll guide you each step of the way, helping you see your project to beautiful completion. Adding evergreen style and impressive value, hardwood flooring can transform your space into a stunning retreat for your family or clients. Hardwood flooring boasts heirloom qualities, and can make a breathtaking impression. Let’s learn more about this time-honored, timeless way to floor. Hardwood flooring truly offers up something for everyone, with options spanning a wide spectrum of colors, textures, sizes, and finishes. For lovers of rustic décor, there are hand-scraped and wire-brushed planks; while those with a more contemporary aesthetic will appreciate our glossy planks and vivid glazes. Today’s hardwood flooring options encompass a whole forest of different tree species. Exotic and domestic, there are many different ways to enjoy hardwood flooring. Oak, pine, maple, cherry, and birch are among the many hardwood species we carry. Each hardwood species offers its own unique wearing abilities, shades, and grain patterns. Solid hardwood planks- the original hardwood flooring- are comprised of solid pieces of natural hardwood. Considered extremely desirable, solid hardwood adds immense value to your property. It can be refinished over and over again, but doesn’t merge well with moist environments. Engineered hardwood offers us another way to enjoy this highly coveted floor. Composed in 7-9 layers of wooden veneer and plywood, engineered hardwood is a denser and more affordable alternative to solid wood. Since it’s made to keep moisture out, engineered hardwood can also be used in spaces where solid wood isn’t welcome: like your finished basement. Hardwood flooring does have a few limits- especially solid hardwood, which should only be used in cooler, dryer spaces that aren’t below grade. Engineered hardwood is a lot more flexible, and can be used at all flooring levels. It can handle humidity, endure heavy use, and resist scratching. Like any other hardwood, however, engineered hardwood isn’t made for your master bath, or for your kitchen. American Carpet One Floor & Home carries all of your favorite hardwood flooring options. From beloved brands that are household names, to Carpet One Floor & Home exclusive brands you’re going to love, experience the difference of shopping a locally owned/operated business belonging to the world’s largest independent purchasing group. Want to learn about the latest hardwood looks? Our expert designers make it easy to stay atop the current trends. In order to retain its natural beauty indoors, your hardwood floor needs some help on your part. Our experts recommend the following plan to keep your precious hardwood in pristine condition.